It’s time to reveal the official fall porch for this year! I have been loving blush tones for this season, a little unconventional but they also bring about such a soft earth tone to fall decor. I used them in my fall table this year, and now my porch! 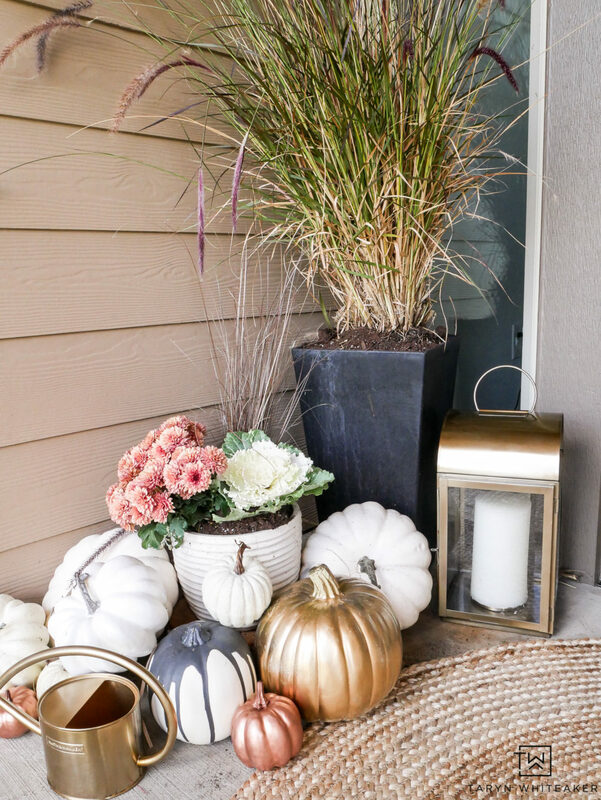 And you will probably see them again too :) Anyway, I’m really excited to reveal my Blush Pink and Gold Fall Porch with you today. And PS. 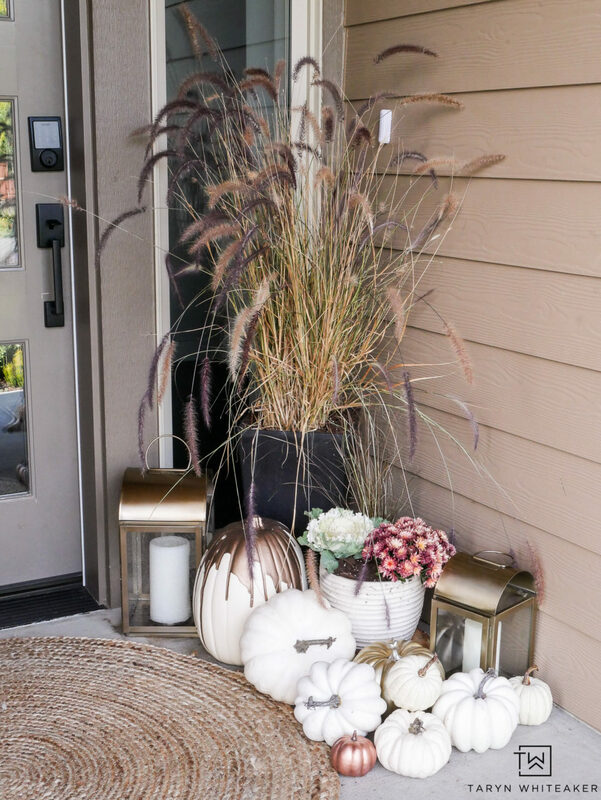 Keep scrolling because you will be able to hop to several other festive fall porches at the bottom of the post! 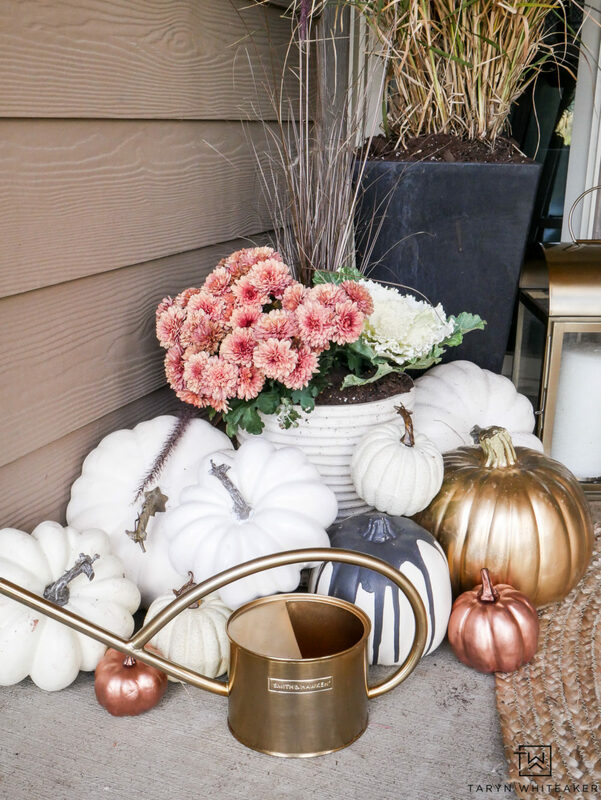 Here is my sweet blush pink fall porch filled with white pumpkins and pops of gold. I love how fresh it feels. I’ve never done anything like this before and it feels different but also me at the same time. I used a mixture of white pumpkins, my paint dripped pumpkins that I made a few years ago, and these gold lanterns I picked up this year! 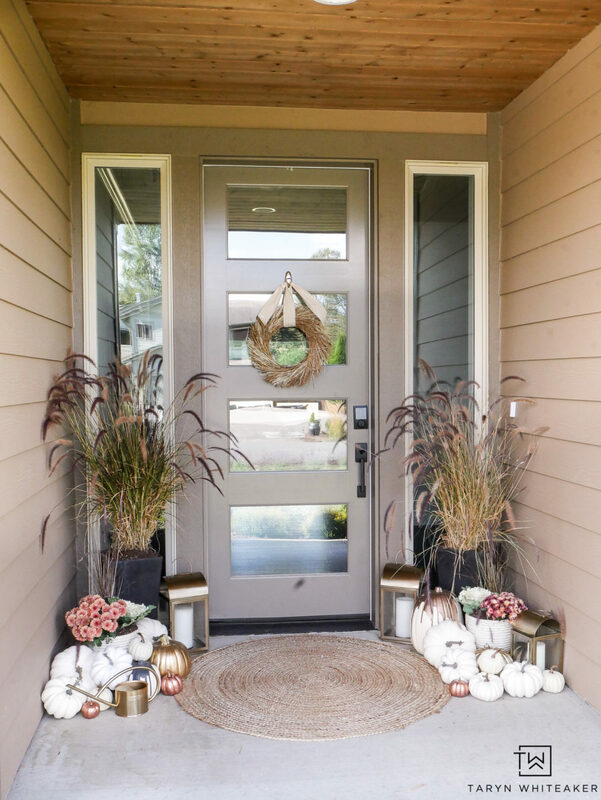 It’s always fun to add a few new pieces of decor to each porch design. 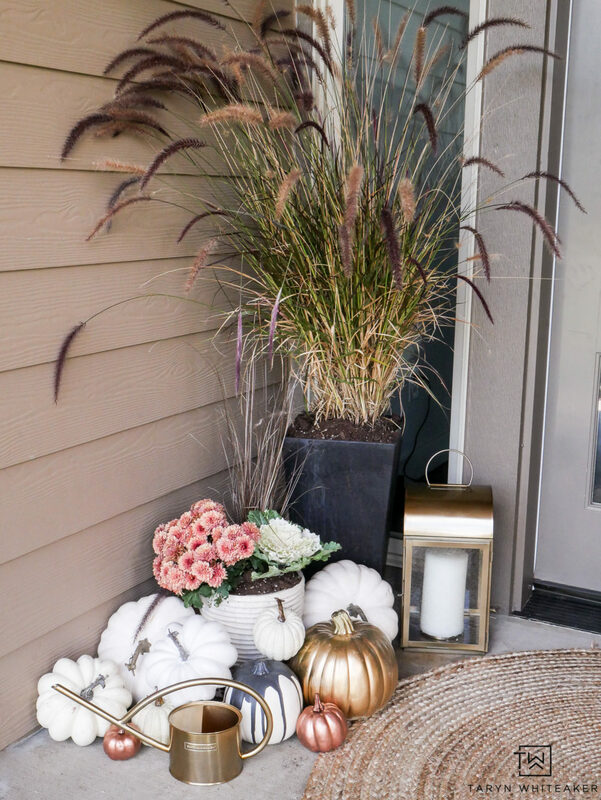 I was originally planning on doing a red and cream porch this year with pops of gold and rust, but I found these tall grasses at a local nursery and HAD to have them. I loved the big dramatic look but also whimsical at the same time. I used these as color inspiration for the rest of the porch. I’m not sure if I have ever seem blush pink mums before, maybe I’ve never paid much attention to them. But I thought they were the perfect mix of colors for out here. 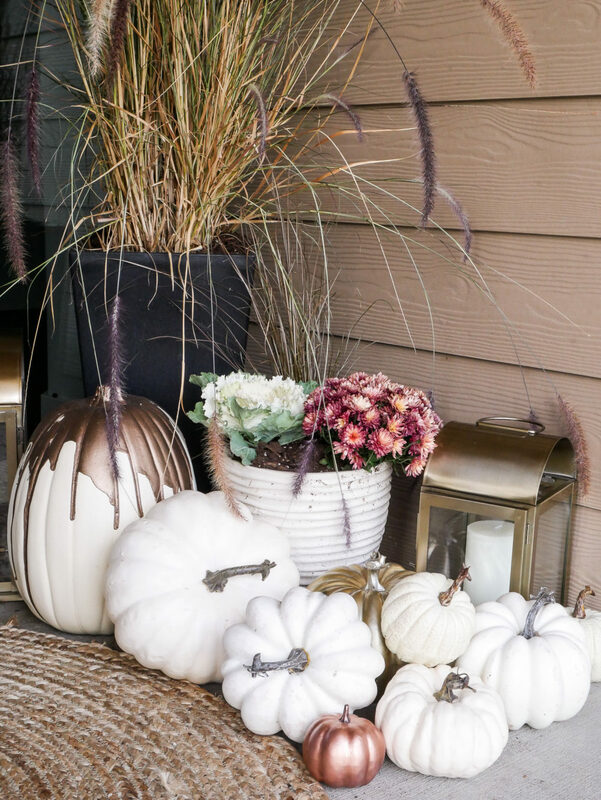 Now go ahead and scroll through all these beautiful and inspiring fall porches. I love how every one is so unique and different. Oh Taryn this is amazing! I love the pink and gold, it is perfect for Fall! Love the grass and the pinks go perfectly with it! I also really love that round rug. Do you have a source for that? Such a beautiful entry, Taryn! I love pink and gold for fall! Hope you are having a wonderful week! Oh the blush pink is SO perfect for fall, especially with the gold. 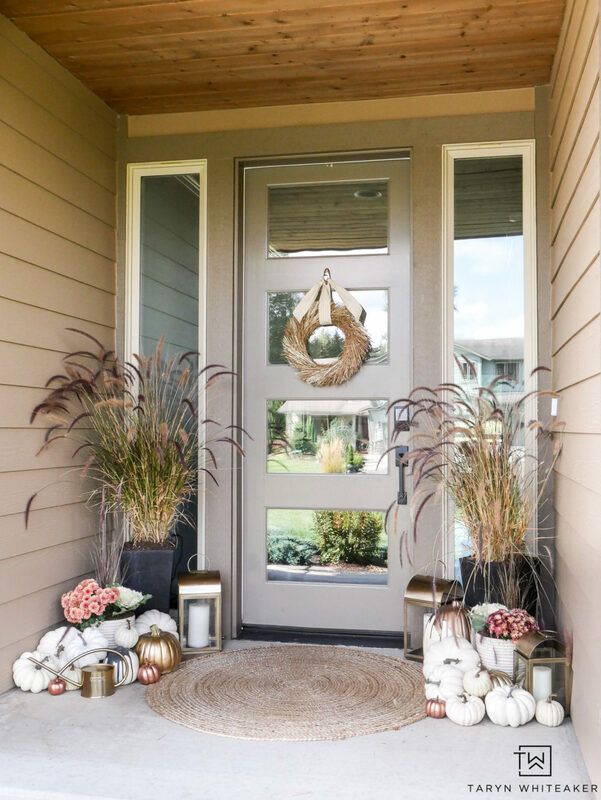 Your porch is gorgeous Taryn!